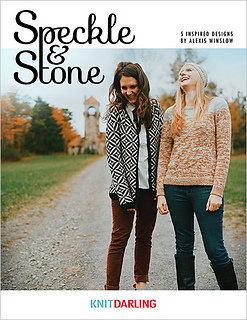 Megan and Amy are excited to be heading out for Thanksgiving break, announce a new Dis or Dat, and review Speckle and Stone by Alexis Winslow. Grab your knitting and join us! Speckle and Stone 5 great patterns inspired by stone and stonework. We love the garments Tiber Cardigan and Arno Pullover, as well as the innovative blending of yarns and colors. Great for partial sweater quantities!